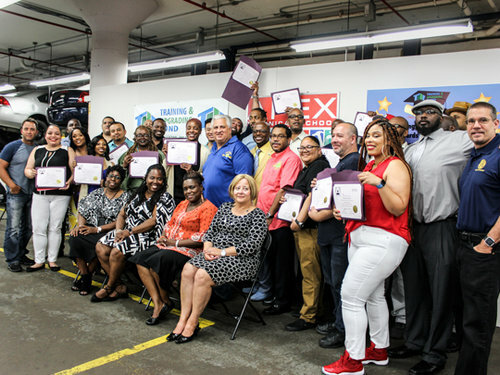 On Tuesday, July 31, 2018, the second class of the TWU Local 100 Upward Advancement Program graduated from the Apex Technical School’s program on electrical theory, wiring and motors. One day later, on Aug. 1, 2018, the 19 graduates started in their new higher paying titles in MOW as Transit Electrical Helper. But for the past six months, the group of former Cleaners, Traffic Checkers and TPPA’s, attended the intense 900-hour program at the region’s top trade school. During the training, the candidates are paid their full transit salary. After graduating, they are guaranteed a budgeted transit position, and will spend the next three years in an apprentice status before being elevated to full journeyman. 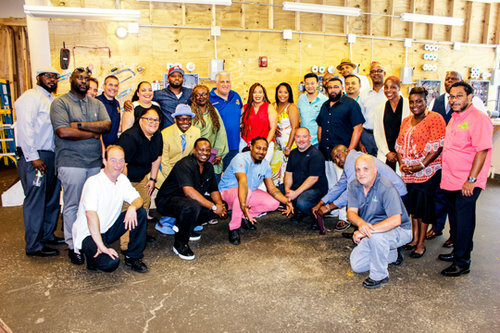 Other officers attending including Secretary Treasurer Earl Phillips, Recording Secretary LaTony Crisp, Administrative Vice President Nelson Rivera, and Vice Presidents John Chiarello (MOW), Shirley Martin (CED) and Derrick Echevarria (Stations).